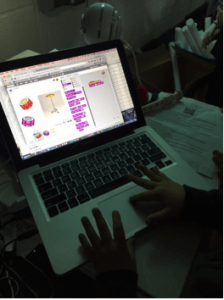 The week of December 7-13, 2015, was the Hour of Code Week. The Hour of Code is a one-hour introduction to computer science, designed to demystify code and show that anybody can learn the basics (https://hourofcode.com/us). Steve Jobs, Apple’s co-founder once said, “I think everybody in this country should learn how to program a computer because it teaches you how to think.” In 2013, President Obama kicked off the Hour of Coding by reminding the students to “Don’t just download the latest app, design it. Don’t just play on your phone, program it.” He reminded students that computers will play a big part in their futures. In Kyle Pearce’s article titled, “Why You Should Learn To Code (And How To Actually Do It! )”, he stated that, “Coding isn’t particularly easy to learn but that’s exactly why it’s so valuable. Even if you have no plans to become a software developer, spend a few weeks or month learning to code and I can guarantee it will sharpen your ability to troubleshoot and solve problems.” When researching this topic, I also found other articles presenting an opposite view, such as coding is not needed as it is a one-trade skill that might not have any use for in the future (Blanda, 2013). And though I can see this side of the argument, coding has been around for decades. It does change with the technology, but the basics of coding still exist. When an alumni of Far Hills Country Day School returned two years ago to talk to the middle schoolers about his experience of being a young entrepreneur, he was asked what should Far Hills be teaching to every student right now. His answer was learning to code because it will open up numerous possibilities for future endeavors. Why should music educators take time out of their curriculum to do this? At this time of the year, many music educators are focused on numerous aspects of their curriculum from performances to assessments. When I thought about this particular week in my curriculum, I felt that the concert preparation for our upcoming holiday concert was the priority. And when I think about concert preparation and my students singing and playing instruments, I feel that they are addressing Job’s quote of how programming a computer makes you learn how to think. You just replace the words, “programming a computer,” with “learning to make music.” However, many of my classes were ready and prepared. Therefore, I did not feel that I was taking time out of my curriculum to include coding. I felt like I was adding to my curriculum. 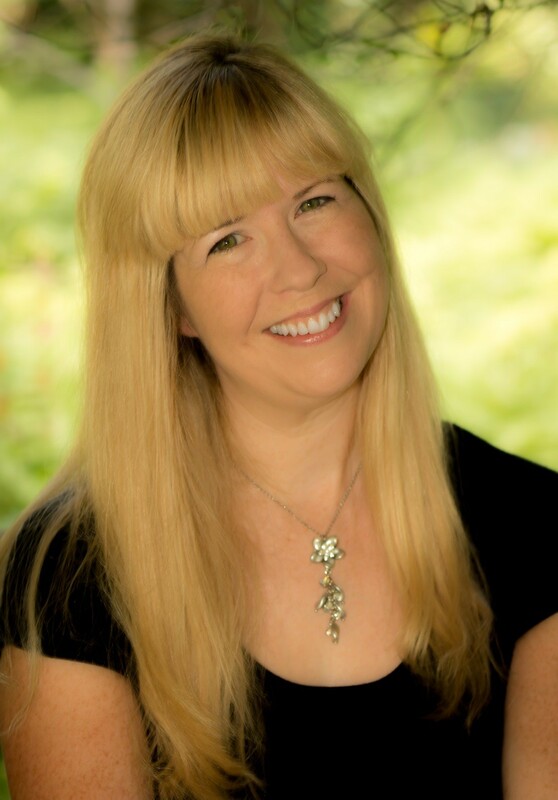 My curriculum consists of singing, performing on instruments, creating music, composing music, responding to music, and connecting music to other subjects across the curriculum. When I thought about coding in the music classroom, I first thought about what the students were learning and then thought about whether or not coding could assist with this. If it could, then I would utilize it. If it could not, then I would use the best (and usually several) tools to teach the music concepts. At this point, the students were immersed into the curriculum connections of their Holiday Concert music. We were studying musical terms such as piano, mezzo piano, and forte, crescendo, singing with a head voice, singing with a chest voice, and more. We were also making curriculum connections with reading (finding spelling words, sight words, and understanding vocabulary), cultures, celebrations, and geography. Finally, we were identifying and exploring the sounds of the instruments found in the recordings of the concert songs. 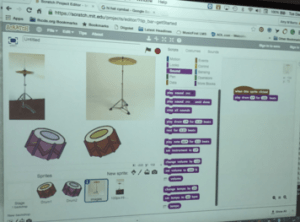 When I knew that the students could code (or create) a drum set with limited amounts of codes, I jumped at this opportunity. Six out of the eight songs that students in grades kindergarten through third were singing had a drum set or percussion on their recordings. As we perform most of our songs live, we hire one of our after school conservatory drum teachers to accompany us. His drum set fascinates the young students every year. What program is used for coding in the second grade music class? 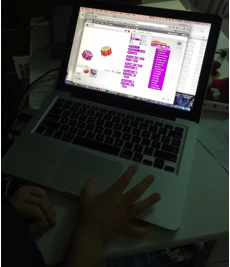 I have used the popular free Scratch coding program found at https://scratch.mit.edu/. Scratch, designed for children ages eight through sixteen, is a programming language and online community where you can create your own interactive stories, games, and animations — and share your creations with others around the world. In the process of designing and programming Scratch projects, young people learn to think creatively, reason systematically, and work collaboratively. When I attended the winter New York State School of Music Association (NYSSMA) conference, Josh Emanuel (http://joshemanuel.com/) showed a tutorial on how to make a drum set. His version took two steps of code per instrument. This was perfect for my young students. I launched Scratch from my laptop and projected it onto the screen. I clicked on the “TRY IT OUT” icon, which lets you create a project without any requirement of signing or logging in. I started with a new “sprite” (a two-dimensional image or animation that is integrated into a larger scene) by clicking on “New sprite.” A new screen popped up, in which I clicked on “Music and Dance,” clicked on a pink drum and clicked OK. As per Josh’s instructions, I clicked on the “Events” tab and clicked and dragged “When this sprite is clicked” to the screen to the right. I then clicked the “Sound” tab and clicked and dragged “Play drum # for # beats” and attached it below to to the “When this sprite is clicked”. I then clicked in the first # and scrolled down to bass drum (#2). I then tested by script by clicking on the pink drum. I showed this process to my second graders and divided them into three groups. Each group had a laptop. They followed the steps together and created their bass drum. Afterward, they continued using the same steps and created more sprites with drum sounds. Some created a set with two drums and two cymbals. When the class time was completed, I had to convince many students that it was time to go because they wanted to stay so that they could create more musical instruments with codes. Why is coding taking place in the music classroom? Coding is another tool to reach your music students. There are students in your classes that would gravitate towards this more than they would towards singing or performing on an instrument. Coding gives you another way to show your students how to create and make music. I once coded an octave of an xylophone and played a song on it. Coding gives you another way to assess students. When I coded the xylophone, I felt that my students would have the ability to do this as well and that it would be a great assessment tool to see if they understand low and high sounds, intervals, musical alphabet, and more. Since we do not have the materials to create a live xylophone, why not try to create a virtual one if we have the laptops to do so? My hope is that this article gives you the opportunity to think about another way to teach a musical concept with an out-of-the-box approach. Pearce, Kyle. “Why You Should Learn To Code (And How To Do It! ).” DIY Genius. DIY Genius, 13 Dec. 2013. Web. 13 Dec. 2015.